R.A. Dickey's the type of self-aware athlete who we'd trust to give an accurate evaluation of his performance on a given night. And so last night, after Dickey was solid if unspectacular against the first-place Nationals while working without his really good knuckleball (his line in the loss: three runs, eight hits, seven innings, two strikeouts, and three walks), Dickey's take was a reasonable one: "It’s not the worst outing to give up three runs in seven innings against that club,” Dickey said, via MetsBlog. “But at the same time, your margin for error is probably minute." But with less than a month to go in the season, Dickey remains a strong candidate for the National League Cy Young Award, and so, turning in "not the worst outing" last night didn't do much for his résumé. This seems like a good time to review that résumé, actually: He leads the National League with an ERA of 2.68 and is tied for second with 197 strikeouts. He's third in WHIP (1.04, just .02 behind the leader), and while wins shouldn't matter, they likely will to certain BBWAA members, so we'll note he's second in that category with eighteen. Fangraphs has him tied for fourth in pitching WAR (behind Clayton Kershaw, Gio Gonzalez, and Johnny Cueto), while Baseball Reference, whose formula for WAR differs from that of Fangraphs, has him second, behind only Cueto (whose stock, we'll note, is falling). Dickey leads the NL with five complete games and three shutouts, and he's second in ERA+ to Cueto. It'll help Dickey's case that there are a handful of other legitimate candidates, but no one that's head and shoulders above the rest. Kershaw, who was great last night after being skipped in his last start because of soreness in his hip, might be the best non-Dickey candidate of the bunch: He's second to Dickey on the ERA leaderboard (2.70 to 2.68) and leads the league with 206 strikeouts. (Dickey is nine behind him in second). Kershaw also leads the NL in innings pitched, though he's only an inning and two-thirds ahead of Dickey. Kershaw leads in WHIP, too, but it's close at the top: He's at 1.02, Matt Cain's at 1.03, and Dickey's at 1.04. Kershaw's first in WAR according to Fangraphs, but he's behind Dickey in third according to Baseball Reference. Will voters who still value wins hold it against Kershaw that he has just a 12-9 record? Not necessarily: Felix Hernandez rightly won the AL Cy Young in 2010 with a 13-12 record. But Kershaw and Dickey are neck and neck in a number of statistical categories. Dickey has to hope that his impressive win total (on fourth-place team, no less) serves as something of a tiebreaker to those voters. It won't necessarily be a two-horse race, of course — closer Craig Kimbrel might also get some attention, in addition to the other starters named above. But Dickey's in decent shape in the season's final weeks, and a strong finish will go a long way, especially to those voters who might be swayed by the phrase "twenty-game-winner R.A. 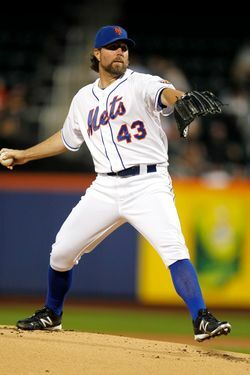 Dickey." The knuckleballer's been one of the best stories in the majors this year, and the Cy Young would be a remarkable ending to this particular chapter of his career. It's in his best interest, though, to do better than "not the worst outing" as he makes his final starts of 2012.